I am sure a lot of parents have a lot of headache when it comes to having a baby running around the house and wreaking havoc like the incredible hulk. Having the gadgets damaged is one thing, having the kid tripped of a bunch of cables and sweeping the entire cabinet worth of hardware off their shelves and injuring the child is another thing. Therefore, it is important to baby proof your house gadgets to prevent any major injuries to anybody in the house. In this guide, I will list some of the ways that you can baby proof your house gadgets. Having wires that are hanging all over the place, exposed or stretching from one end to another is one BIG NO GO. Plan your cabling, if possible route the cabling of your your house appliances to be behind the desk or structure. Use the weight of the shelve / desk to pin the cables to the wall. That way, the baby will never be able to pull any wire off where it is supposed to be. Carpets can be a good way to hide cables under the ground off plain sight and it prevents any one from tripping over. But the maintenance and cleaning of the carpet can kill if your baby spills anything onto the carpet. 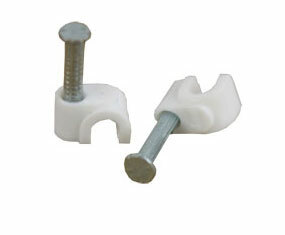 An alternate way to keep cables pinned down will be to make use of the nail it down clips which are very cheap. As for the power cables, it will be a good investment to purchase a power strip cover. 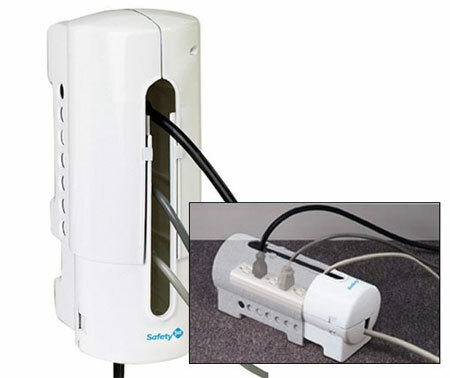 This is a piece of hardware that acts like a extension cord with a hard casing that can be locked so that there will be no way anyone can reach into the plug and pull it off the electrical point. Allowing a baby to pull off the power might result in accidental electrical shock which can result in a nasty injury. To prevent any accidental deletion or loss of data caused by your baby who will most likely start typing on your laptop like a pro when you are away from your desk, it is very strongly advisable to lock your computer with a password. You can lock your laptop is simply pressing the Windows Key + L together which will not take more then 1 sec. Do the same for your smartphone, don’t be surprised that the next time you look at your phone, the entire Apps Store has been purchased without you knowing it. Never under-estimate the shocking ability of a baby. There’s this article where by a mom was stunned when one industrial excavator was delivered to her door step and the purchase was apparently made by her baby. One of the most common damage that occur is when a baby pulls something off the table or crashes into a shelve with his baby walker. Such actions can knock something off. These days, LCD screens are so light that they can be easily toppled over. Use a wall bracket to secure the screen to the wall and make it high enough to be within reach of a young baby. You should do so for speakers. Laptops can be secured with kensington locks, simply shorten the length of the kensingotn cable until it does not leave a certain position. A good idea is to drill a hole on the table and have the kensington lock run past under the table. Then the laptop will stay in one position. As for mobile phones, you can opt for those rugged protection covers that claim to take a beating. No guarantees from me that your phone will be protected. At least it is some form of protection if dropped from low heights. There are more then the following ways you can baby proof your house gadgets, I am just stating some of the more important ones. If you have any more suggestions that you might want to share with the readers, feel free to comment in the comments section below. I hope you like this article on how to baby proof your house gadgets.